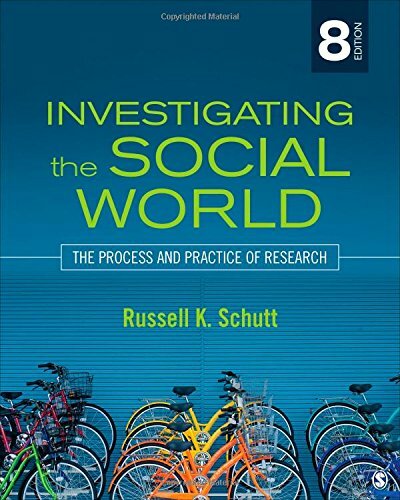 1483350673 -In this exciting newEighth Editionof his leading social research text, author Russell K. Schutt, an award-winning researcher and teacher, continues to make the field come alive through research stories that illustrate the methods presented in each chapter. Through numerous examples and hands-on exercises that help students learn by doing,Investigating the Social Worldhelps readers understand research methods as an integrated whole. Readers will learn to appreciate the value of both qualitative and quantitative methodologies and understand the need to make ethical research decisions while also learning about research on contemporary social issues like the Internet and social relations, the police response to domestic violence, the sources of democracy, the determinants of voting, the impact of disasters, and the causes of violence.